Every year between March and May, the Westport Farmers’ Market lies fallow. It’s a time when farmers prep for the new season. But to do that, they need seeds. And — with spring just (please, God) around the bend — so do Westporters with gardens of any size and type. 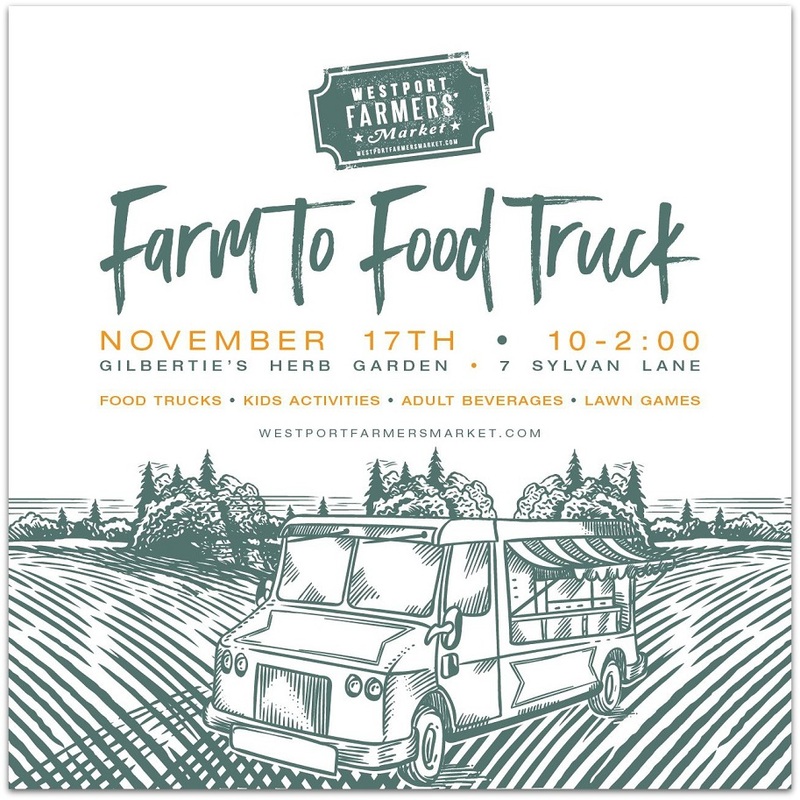 So on Saturday, March 16, the Westport Winter Farmers’ Market says goodbye to its indoor Gilbertie’s Herbs and Garden Center home with a free seed exchange. Everyone is invited to bring seeds saved from their own garden — or take home a few saved by others. WFM farmers will donate seeds from their favorite crops too. All seeds are welcome — except those from invasive species (click here for the list). However, the market encourages people to bring and take home heirloom or organic varieties. “Heirloom seeds are critical to reclaiming our food system,” says Farmers’ Market executive director Lori Cochran-McDougall. The seed exchange runs this Saturday from 10 a.m. until 2 p.m. — or until all seeds are shared. Gilbertie’s is located at 7 Sylvan Avenue South. Adult beverages and music will be provided. Can you dig it? For years, the Westport Farmers’ Market and Staples High School’s culinary arts program have teamed up to bring great food to folks in need. Once a month, students shop for provisions at the market. Then they prepare and serve a delicious, nutritious meal at the Gillespie Center. Yesterday, many more people got in the act. 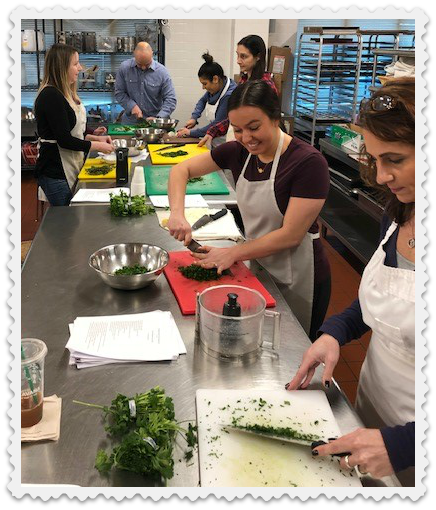 As part of Westport’s Professional Development Day, culinary students and staff helped interested teachers — from throughout the district — shop for ingredients, then create and serve a meal too. 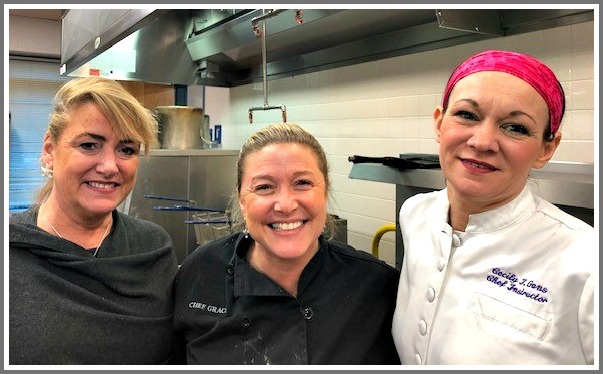 The initiative was led by Staples’ 3 culinary instructors: Cecily Gans (owner of The Main Course Catering, and a member of the Farmers’ Market Board); Alison Milwe-Grace (owner of AMG Catering and Events), and Laura Wendt. Staples’ 3 culinary instructors (from left): Laura Wendt, Alison Milwe-Grace, Cecily Gans. The goal was to give educators in the district “an overview of the culinary program’s relationship with the community, the Farmers’ Market, the farmers who provide the raw product for meals the students create, and the challenges those students face as they put meals together,” Milwe-Grace says. Gans adds, “Building relationships around local food, and connecting farmers to the recipients of the food they grow, catch or raise is fundamental to the Farmers’ Market mission.” The Professional Development Day event strengthened other relationships too: those between students and teachers. The Farmers’ Market and culinary instructors are dedicated to helping students “grow” — as cooks and people. Yesterday, those students turned the tables on some of our town’s top teachers. 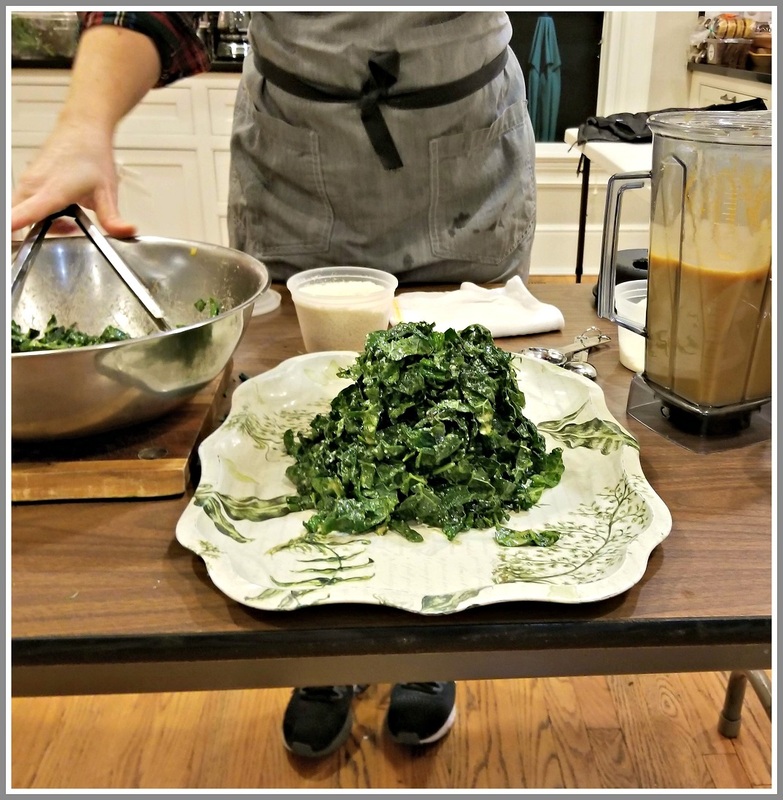 Westport teachers cook for the community. Well, not quite. It’s still fall. But the Westport Farmers’ Market is moving from outdoors to inside. To celebrate, they’re throwing a party at their winter home: Gilbertie’s Herbs and Garden Center (7 Sylvan Road). From 10 a.m. to 2 p.m. this Saturday (November 17), everyone can enjoy lawn games, fairy house making and pumpkin bowling (?!). There’s live music, a giving tree, and a special giveaway. Of course Farmers’ Market vendors — old and new — will be on hand. Food trucks will offer a variety of eats. And Athletic Brewing Company will offer adult beverages. Hey, it’s 5 p.m. somewhere. 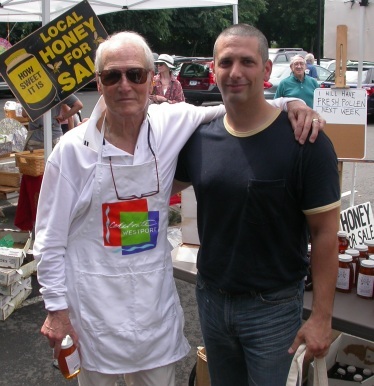 Throughout the summer, anyone visiting the Westport Farmers’ Market could hang out with Paul Newman. Sure, one of our most famous and beloved neighbors died 10 years ago this past Wednesday. And to make sure, Newman’s Own Foundation — the Westport-based charity that in over 35 years has given away more than $530 million — sent a video crew to the Thursday market to record our memories of him. In typical fun Newman fashion, they provided a cardboard cutout of the movie star/race car driver/philanthropist (and Farmers’ Market co-founder) — famous blue eyes and all. Westporters described seeing him around town, including at Hay Day and descending in a helicopter onto the Coleytown Junior High School soccer field. (Hey, that’s me talking!). The video will be shared by Newman’s Own Foundation on social media. 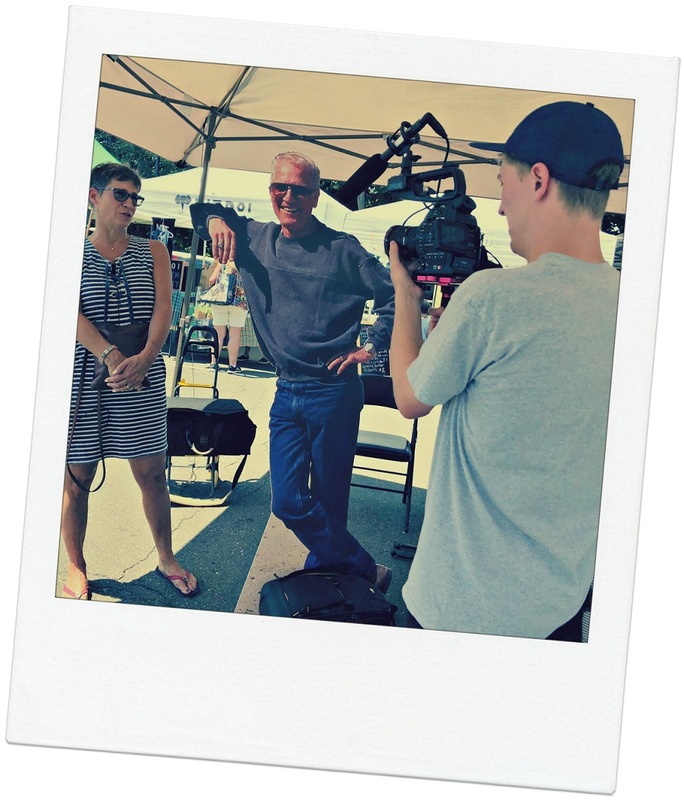 As previewed earlier this week, Paul Newman made a special appearance today at the Westport Farmers’ Market. The movie star/blue-eyed idol/race car driver/food purveyor/philanthropist — and, for 50 years, our neighbor — is unfortunately no longer actually here with us. But a life-size cutout of him stood under a tent, in the bustling market on Imperial Avenue. Dozens of shoppers of all ages stopped by to pose for a photo. Many had stories. A camera crew from Newman’s Own Foundation — the Westport-based charity that in over 35 years has given away more than $530 million — recorded Newman-related memories. It’s a Foundation project, for use as a video and on social media. If you missed him today, don’t worry. Paul will be back on Thursday, August 16 (10 a.m. to 2 p.m.). His eyes will be as blue as ever. It was the 1970s. Early one summer evening, some friends and I were playing pick-up soccer on the front field at Coleytown Middle (then Junior High) School. Suddenly, a helicopter hovered overhead. We scattered. It landed. Out stepped Paul Newman. He wore shorts — and carried a briefcase. “Hi, boys!” he said cheerily. The helicopter whirred back into the sky. And, with a wave, one of the most famous actors in the world walked around the corner to his home. Westporters of a certain age remember Paul Newman as one of the most famous movie idols of the 20th century — and our neighbor. The man. The legend. The US postage stamp. Younger Westporters — and their counterparts all around the country — know him as a salad dressing, popcorn and lemonade guy. Lost in all that is the fact in 2006 that Paul Newman — who, don’t forget, was also a race car driver, and the founder of the Hole in the Wall Gang Camp — teamed up with Michel Nischan to start The Dressing Room. 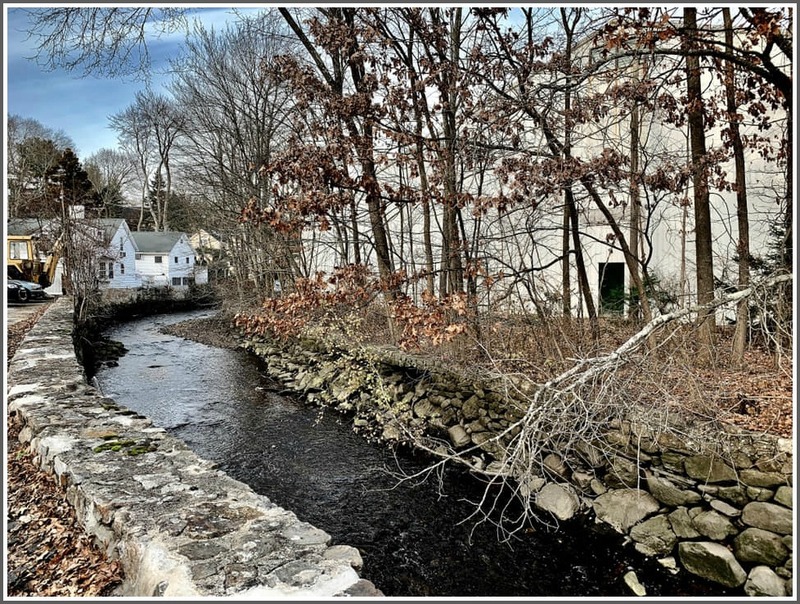 That superbly named restaurant next to the Westport Country Playhouse was Fairfield County’s first farm-to-table restaurant. And — thanks to the star power of its 2 owners — it helped kick-start a whole new way for local residents to look at food. Here’s something else many folks don’t know (or forgot): The Playhouse parking lot was the original site of the Westport Farmers’ Market. The location was convenient and open. Both Newman and Nischan helped plant the seed, and watched it grow. 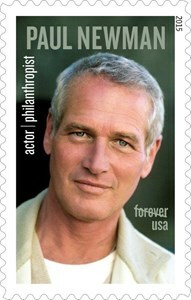 Paul Newman often shopped at the Westport Farmer’s Market. He was a particular fan of the locally produced honey. From 10 a.m. to 2 p.m. at this Thursday’s Farmers’ Market — and also on Thursday, August 16 — everyone is invited to share their memories of Paul Newman. Newman’s Own will bring a life-sized cutout of their founder to the Market (now bigger than ever, at the Imperial Avenue parking lot). Video equipment will be on hand to record stories and tributes. Clips may be shared by Newman’s Own Foundation, in a video and on social media. Can’t make it to the market? Submissions can be emailed: social@newmansownfoundation.org. There must be a million Paul Newman stories in Westport. Let’s start those cameras rolling. The Westport Farmers’ Market is 12 years old — and wildly popular. Every Thursday from May through November throngs fill the Imperial Avenue parking lot, on a hunt for fresh produce, meat and fish, baked goods, even pizza, tacos and dog food. But the Market always looks to add spice to its spices, herbs and more. So — even though the Westport Farmers’ Market is a community celebration, not a competition — they’re introducing a Chef of the Market contest. Starting this Thursday — and running once a month through the fall — 12 well-known names battle it out through an opening round, semifinals and finals. The winner will be, I guess, the chief chef. The brainchild of board member — and no-slouch-himself chef Bill Taibe — works like this. On the 3rd Thursday of each month, 3 chefs go head-to-head-to-head. At 10 a.m., they get $20. They have 45 minutes to shop for ingredients, cook, and present their appetizer-size dish to the judges. PS: Electricity is not allowed. In keeping with the fun theme, judges are randomly selected from any shopper who wants to participate. The first round runs through August. The winner of each group moves on to the semifinals, the 3rd Thursday in September. Finals are set for “Fork it Over,” the Westport Farmers’ Market annual October fundraiser. All chefs donate one $50 gift certificate from their restaurant. The winner gets every gift card — so he can enjoy his competitors’ meals yet not pay for them — along with other prizes. The early chefs — particularly those tomorrow — have it tough. They can’t choose from flavorful snap peas, strawberries or squash. However, Taibe is sure they’ll do imaginative, tasty things with this month’s bounty, like radishes and kale. 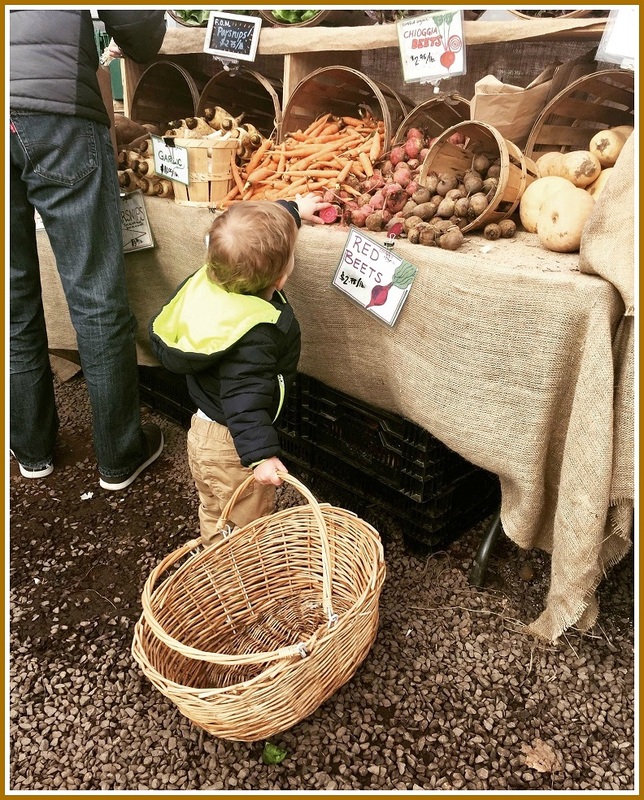 Fresh produce is one of the Westport Farmer’s Market’s most popular attractions. Chefs competing in this year’s competition know exactly how to prepare it. But can they shop for it — and finish their dish — in just 45 minutes? All 12 chefs gathered at the Market last week, to pick their dates out of a hat. There was already smack talk — including between the chefs at Taibe’s own Whelk, Kawa Ni and Jesup Hall, all of whom are competing. Other Westport chefs represent The Cottage, OKO, Match Lobster Burger and Amis. There’s chatter on social media too. Starting Thursday, the rest of us can see where it all leads. Let the Chef of the Market games begin! 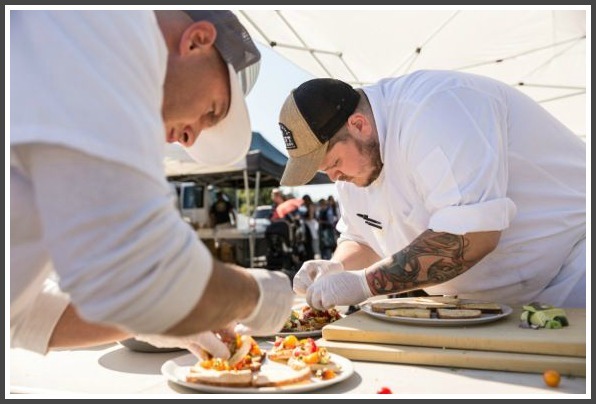 Chef competitors include: May 24, Geoff Lazlo, Ben Freemole, Christian Wilki; (June 21) Matt Storch, Jeff Taibe, Adam Roytman; (July 19), Jonas/Brad, Anthony Kostelis, Anthony Rinaldi; (August 16) Nick Martschenko, Dan Sabia, Carlos Baez. Farmers’ markets are cool. They usually have fresh produce. Shopping there boosts local economies. It’s hassle-free and homey. The Westport Farmers’ Market is that — and much, much more. It’s dynamic, constantly evolving, and a true community event. One element contributing to all that is programming. There are demonstrations, projects, and ongoing partnerships. One of the most creative and meaningful is called Farmers to Veterans to Community. The program gives military vets affiliated with Homes for the Brave in Bridgeport a chance to prepare farm-fresh food under the guidance of WFM’s vast chef network. Homes for the Brave helps homeless men and women, and their families, attain housing and learn life skills. Through the Farmers’ Market, veterans learn about the health benefits of local food — and job opportunities with area restaurants. It’s a win-win-win — for vets, farmers and restaurateurs. Of course, it helps the entire community — and economy — too. FVC began 2 months ago, with 6 women. Chef Jennifer Balin — a Westporter who owns Sugar & Olives, just over the Norwalk line — and chef Dan Sabia of Jesup Hall pioneered the program. They shop at the indoor farmers’ market, then bring ingredients to the kitchen at the women’s home. They demonstrate cooking techniques. Then, at dinner, they share recipes, and discuss life skills and employment opportunities. One job may already be in the works. 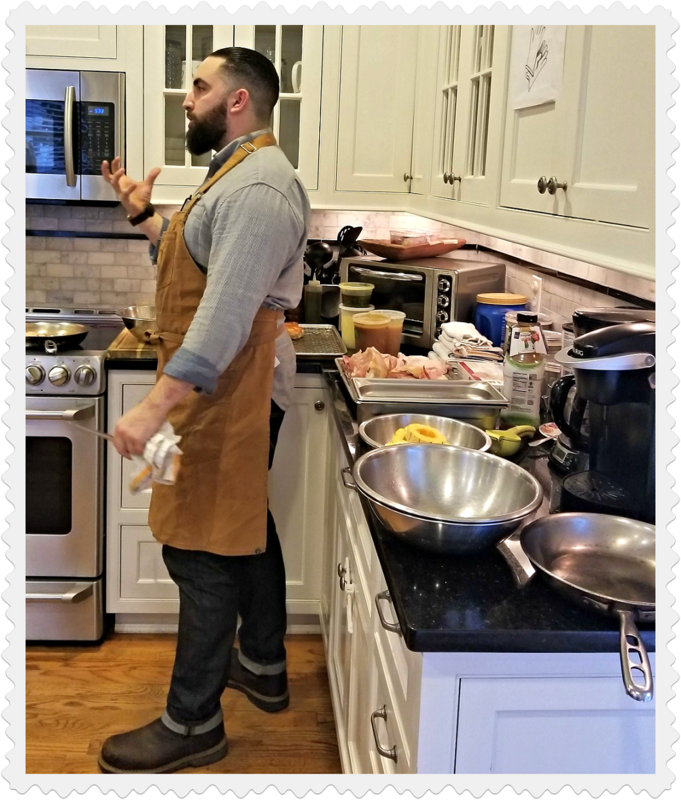 Chef Dan Sabia of Jesup Hall explains his technique. More dinners are planned for February. Chefs Geoff Lazlo, Bill Taibeand Matt Storch, along with food blogger Liz Rueven, will participate. Westport Farmers’ Market executive director Lori Cochran-Dougall is justly proud of her creative programming. But, she admits, Farmers to Veterans to Community is special. “This puts to work — literally — our values of giving back ot the community, by helping those who have given so much of themselves,” she says. What a wonderful recipe for success! Chef Jennifer Balin’s delicious table, at Homes for the Brave.